Madison Avenue is a north-south avenue in the borough of Manhattan in New York City, United States, that carries northbound one-way traffic. It runs from Madison Square (at 23rd Street) to meet the southbound Harlem River Drive at 142nd Street. In doing so, it passes through Midtown, the Upper East Side (including Carnegie Hill), East Harlem, and Harlem. It is named after and arises from Madison Square, which is itself named after James Madison, the fourth President of the United States. Madison Avenue was not part of the original New York City street grid established in the Commissioners' Plan of 1811, and was carved between Park Avenue (formerly Fourth) and Fifth Avenue in 1836, due to the effort of lawyer and real estate developer Samuel B. Ruggles who had previously purchased and developed New York's Gramercy Park in 1831, who was in part responsible for the development of Union Square, and who also named Lexington Avenue. Since the 1920s, the street's name has been metonymous with the American advertising industry. Therefore the term "Madison Avenue" refers specifically to the agencies, and methodology of advertising. "Madison Avenue techniques" refers, according to William Safire, to the "gimmicky, slick use of the communications media to play on emotions." Madison Avenue carries one-way traffic uptown (northbound) from East 23rd Street to East 135th Street, with the changeover from two-way traffic taking place on January 14, 1966, at which time Fifth Avenue was changed to one way downtown (southbound). Between East 135th Street and East 142nd Street, Madison Avenue carries southbound traffic only, and runs parallel to the Harlem River Drive. The term "Madison Avenue" is often used metonymically for advertising, and Madison Avenue became identified with the American advertising industry after the explosive growth in this area in the 1920s. According to "The Emergence of Advertising in America", by the year 1861, there were twenty advertising agencies in New York City; and in 1911, the New York City Association of Advertising Agencies was founded, predating the establishment of the American Association of Advertising Agencies by several years. In recent decades, many agencies have left Madison Avenue, with some moving further downtown and others moving west. Today, only a few agencies are still located in the old business cluster on Madison Avenue, including StrawberryFrog, TBWA Worldwide and Doyle Dane Bernbach. However, the term is still used to describe the agency business as a whole and large, New York–based agencies in particular. 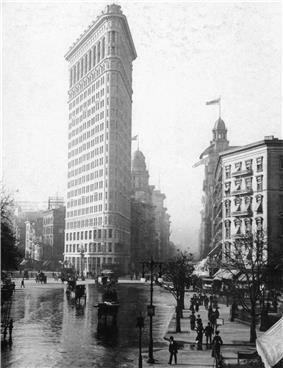 Madison Square is formed by the intersection of Fifth Avenue and Broadway at 23rd Street. The square was named for James Madison, fourth President of the United States. The focus of the square is Madison Square Park, a 6.2-acre (2.5-hectare) public park, which is bounded on the east by Madison Avenue, which starts at the park's southeast corner at 23rd Street; on the south by 23rd Street; on the north by 26th Street; and on the west by Fifth Avenue and Broadway as they cross. Madison Square Garden takes its name from the location of the first building of that name, which in turn takes its name from its location on the northeast corner of Madison Square at 26th Street and Madison Avenue. The first Garden was a former rail station that was converted into an open-air circus venue by P. T. Barnum in 1871 and was renamed "Madison Square Garden" in 1879. (The New York Life Insurance Building now occupies that entire city block.) The original Garden was demolished in 1889 and replaced by a new indoor arena designed by Stanford White that opened the following year. The second Garden had a bronze statue of the Roman goddess Diana on the tower of the sports arena. When it moved to a new building at 50th Street and Eighth Avenue in 1925 it kept its old name. Madison Square Garden is now located at Eighth Avenue between 31st and 33rd Street; however, it still retains the name. Madison Avenue is served by the M1, M2, M3, M4, and Q32 local NYCT Buses, and the BxM3, BxM4, BxM6, BxM7, BxM8, BxM9, BxM10, BxM11, BxM18, QM21, X10, X17, X63, X64, X68 express NYCT Buses, and also Bee Line BxM4C express buses. These buses use an exclusive bus lane between 42nd and 59th Street, but the bus lane is not present in any other portion of the avenue. Pursuant to Section 4-12(m) of the New York City Traffic Rules, driving a vehicle other than a bus in the bus lane on Madison Avenue to turn right during the restricted hours specified by sign between 42nd Street and 59th Street is prohibited, then permitted at 60th Street, but a taxicab carrying a passenger may use the bus lane to turn right at 46th Street. In July 1987, then New York City Mayor Edward Koch proposed banning bicycling on Fifth, Park and Madison Avenues during weekdays, but many bicyclists protested and had the ban overturned. 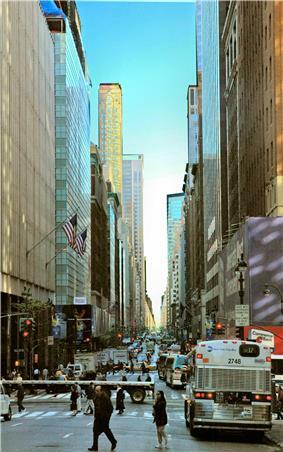 When the trial was started on Monday, August 24, 1987 for 90 days to ban bicyclists from these three avenues from 31st Street to 59th Street between 10 a.m. and 4 p.m. on weekdays, mopeds would not be banned. ^ Martin Mayer, Whatever happened to Madison Avenue? : Advertising in the'90s (Little, Brown, 1991). ^ a b c d "Advertising Ephemera Collection - Database #A0160". Emergence of Advertising On-Line Project. Advertising & Marketing History, John W. Hartman Center for Sales, David M. Rubenstein Rare Book & Manuscript Library, Duke University. 1997. Retrieved 2012-10-02. ^ Rothenberg, Randall (February 2, 1989). "Madison Ave. Quits Madison Ave.". The New York Times. ^ Deborah Leslie, "Abandoning Madison Avenue: the relocation of advertising services in New York City." Urban Geography (1997) 18#7 pp: 568-590. ^ New York City Traffic Rules, New York City Department of Transportation. ^ A vehicle defined in Section 4-01(m) of the New York City Traffic Rules does not include human-powered device such as a bicycle. ^ Dunham, Mary Frances. "Bicycle Blueprint – Fifth, Park and Madison", Transportation Alternatives. Accessed April 27, 2009. ^ Yee, Marilynn K. "Ban on Bikes Could Bring More Mopeds", The New York Times, Tuesday, August 25, 1987. Accessed April 27, 2009.